Equip yourself with the tools and knowledge to align with strategic investors, raise capital, and grow your business. Sana Kapadia, Chief Impact Officer, Spring Activator, has mentored countless startups through capital raising, with $4M raised in 2015. Now she’ll teach you how to be strategic in your investment-seeking methods. Who Should Attend Insider’s Guide to Raising a Round? This session is designed for CEOs and founders of growth-oriented startups based in Vancouver. This event is open to startups from all industries. We particularly encourage the participation of those interested in also applying for the upcoming Capital Mentorship Programs: the three summer and fall intakes will be tailored for virtual, augmented & extended reality (VR/AR/XR), life sciences and female-led and -founded startups. Your business should have already launched its product or service, raised a seed round or two, and be ready for the next stage of growth; you are poised to seek additional external sources of funding, and looking to raise capital in the next 6 months (i.e. working on a new iteration of your original investment strategy). Sana is Chief Impact Officer at Spring Activator, where she drives its mission to help entrepreneurs build better businesses and raise smart capital. She brings a rich global background in impact investing, investment banking and equity research. She is also the co-founder of RAISE Collective, a community of female investors, founders and champions changing the gender ratio in investment. She actively mentors social entrepreneurs, provides financial literacy training and is an active guest speaker, facilitator, and judge at various social impact events, helping to foster the impact and tech start-up ecosystems. After attending the Insider’s Guide to Raising a Round, companies are encouraged to apply for the MasterMind Capital series. The series invites investor-ready entrepreneurs to dive deeper into the capital raising process and how to prep for it. Over the following weeks, Spring and select partners will facilitate 2-hour sessions to work through investor profiles & funnels, pitch preparation, due diligence preparation, and negotiation skills. Details on how to apply will follow the Insider’s Guide to Raising a Round Session. Up to 16 companies will be selected to participate in each program and will be considered for inclusion in the VC-adjudicated Investor Showcases scheduled in the end of the Fall months. Please note that while participation in the MasterMind Capital series and the Insider’s Guide to Raising a Round workshop may arm you and your startup with the skills to pitch and raise capital, it does not guarantee a position in the Investor Showcases. This event is free to attend, but all participants must register. 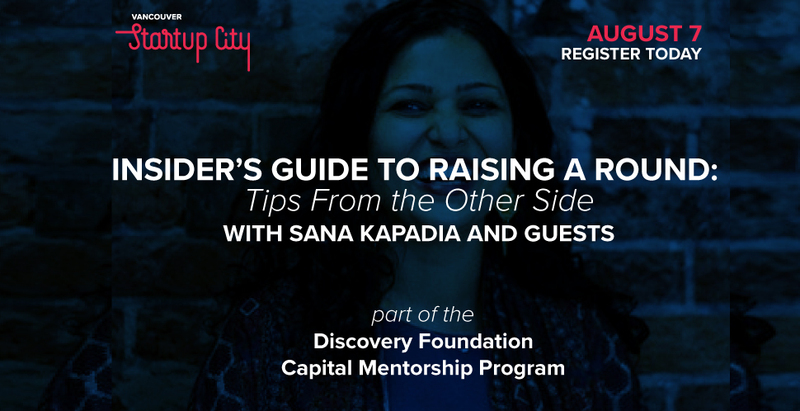 The Discovery Foundation Capital Mentorship Program is designed to help entrepreneurs become more strategic in raising the capital critical to accelerating their ventures. This program is for CEOs and founders of growth-oriented tech companies who have already launched their producer or service.